Loved working with sweet little Yashvi for her newborn session. I loved that she had a gorgeous full head of hair! She came to me at three weeks old, and it took some work to get her to sleep, but once she was out she did a fabulous job. 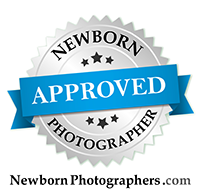 Many parents come in to the studio for their newborn photography session, worried that their baby will not sleep. I've been photographing newborns for eight years, and I always get them to sleep during sessions. Your baby is in experienced hands, so no worries!